Quick Pickle Spicy Celery Sticks! Dill Pickle Cheddar Cheese Soup! Creamy Dill Pickle Chicken With Bacon! 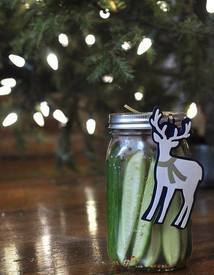 One of my favorite holiday traditions in my extended family is for me to make sour dill pickles as gifts for everyone! For many years I have been making them with the “help” of my best friend’s son who has slowly become more and more helpful as he has grown. Sadly this year the biggest pickle lovers in the family have now moved to other cities and you can’t bring a jar of pickles on the plane. So this year I’m hoping some of you will pick up this tradition and make some pickles as gifts for your friends and family!